President Donald Trump ripped Google on Tuesday, attacking the search engine for what he said was the unfair promotion of the “fake news media” and accused the company of “suppressing” conservatives viewpoints. “Google search results for “Trump News” shows only the viewing/reporting of Fake New Media. In other words, they have it RIGGED, for me & others, so that almost all stories & news is BAD. Fake CNN is prominent,” he said. 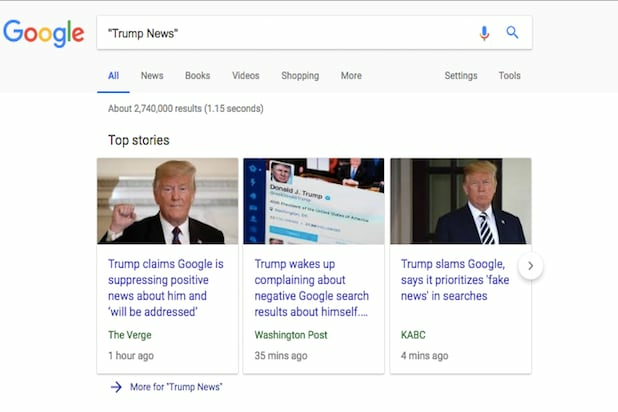 A Google search for “Trump News” by TheWrap at 8:13 a.m. Eastern saw top results coming from the Washington Post, The Verge and local station KABC — all were stories about Trump’s tweet attacking Google for suppressing conservative voices. 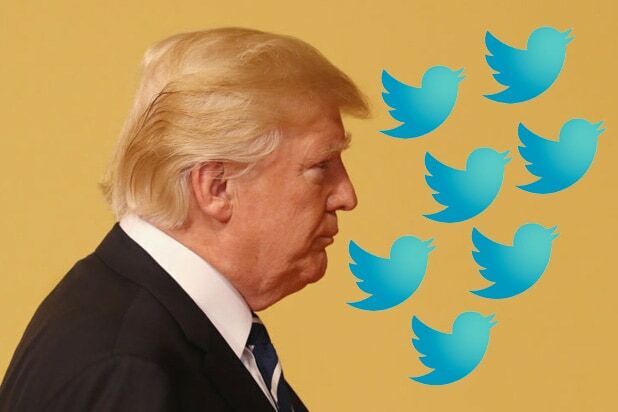 The attack from Trump comes days after he accused social media companies of perpetrating the same activity after questions were raised by Vice News and others about the growing evidence that conservatives voices were being “shadow-banned” by websites like Twitter. 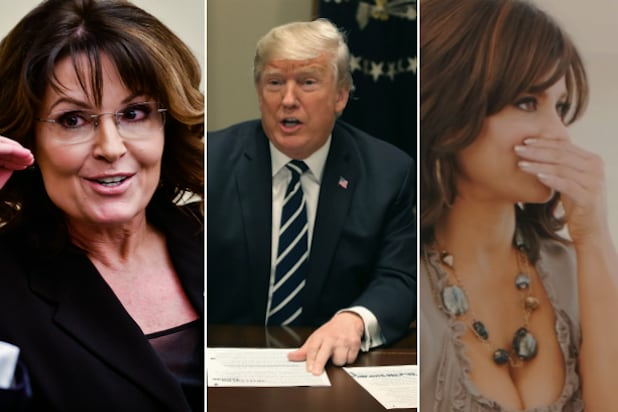 Like with Google, Trump promised that any kind of “censorship” of conservative media would be addressed in some way — though he remained vague on specifics. “Social Media is totally discriminating against Republican/Conservative voices. Speaking loudly and clearly for the Trump Administration, we won’t let that happen. They are closing down the opinions of many people on the RIGHT, while at the same time doing nothing to others. Censorship is a very dangerous thing & absolutely impossible to police. If you are weeding out Fake News, there is nothing so Fake as CNN & MSNBC, & yet I do not ask that their sick behavior be removed. I get used to it and watch with a grain of salt, or don’t watch at all. Too many voices are being destroyed, some good & some bad, and that cannot be allowed to happen. Who is making the choices, because I can already tell you that too many mistakes are being made. Let everybody participate, good & bad, and we will all just have to figure it out! You can read more about that tweetstorm here. Reps for Twitter, including chief Jack Dorsey, have repeatedly denied any suppression of voices based on political affiliation. In a statement, Google denied the charges. “When users type queries into the Google Search bar, our goal is to make sure they receive the most relevant answers in a matter of seconds. Search is not used to set a political agenda and we don’t bias our results toward any political ideology,” said the company.